The American Kitefliers Association (AKA) is soliciting bids from interested individuals or organizations to assume the duties of Kiting Editor/Publisher, beginning with the Fall Issue 2015. The AKA intends to execute a contract with the party whose proposal best meets the needs of AKA as described in this announcement. The American Kitefliers Association (AKA), a private nonprofit organization devoted to the enhancement and enjoyment of kiteflying and kitemaking, has approximately 2,000 members in the U.S. and other countries. The Association was formed in 1964 with the mission to educate the public in the art, history, technology, and practice of building and flying kites and to advance kiting, its joys and values, in all nations. The Association maintains historical records, publishes the journal Kiting, facilitates communication among kitefliers, and promotes kiteflying in many ways. The Association’s policies are determined by a 22-member Board of Directors, which consists of an annually-elected President, 13 Regional Directors (one-third of whom are elected each year), and an appointed Executive Committee. All officers of the Association serve on a volunteer (non-paid) basis. Major tasks, such as those of Executive Director and Kiting Editor/Publisher, are performed by independent contractors. 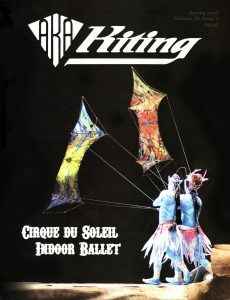 Initially, Kiting was the newsletter of AKA; and started publication in 1979. In 2001, the newsletter was expanded in size and scope to become the nation’s only remaining kite-related magazine. Kiting Magazine is published four times a year; mailing on the first day of March, June, September, and December. The Kiting Editor/Publisher is responsible for all tasks related to the creation and production of the magazine except printing and mailing, which is overseen by the Executive Director. The Editor/Publisher is accountable directly to the AKA President and Board of Directors. While continuing to include club-related material, it is the AKA’s anticipation that Kiting will also include more feature material which will more effectively serve the educational purposes of the Association, as defined in the AKA mission statement described above. Proposals must be received by April 15, 2015 in order to be considered. No extensions of time will be granted. Proposals may be submitted by mail, but email submission is preferred, in Microsoft Word or PDF format. If submission is by regular mail, six copies must be submitted to the Committee. One of these copies must be unbound so that additional copies may be made. Brevity will be appreciated; attached materials that are not readily reproducible by scanning or standard photocopying processes should be avoided. The Kiting Editor/Publisher will be responsible for all facets of producing AKA’s quarterly magazine, including soliciting and writing articles, editing and proofreading submitted materials, typesetting and page design, and coordination with the printer for completion of each issue of the magazine, and coordination with the mailing house for the distribution of each issue to AKA’s members and other recipients. The Editor/Publisher is responsible for obtaining the most cost-effective arrangements for producing and publishing the newsletter. In cooperation with the Executive Director, the Editor will prepare an annual budget of printing, mailing, and production costs to be evaluated by the Board as part of the annual budget process. The Kiting Editor/Publisher is paid per issue on a fixed price basis, including labor, overhead, general and administrative expenses, use of computers and other office equipment. Salary is determined by the AKA Board of Directors. Reasonable travel, hotel, and registration expenses for the Editor/Publisher’s attendance at the Annual Meeting and Convention will be reimbursed by AKA. This contract will commence with work on the Fall 2015 issue of Kiting, which is scheduled to be mailed September 1, 2015; and will terminate with the June 1, 2016 publication of the Summer 2016 issue. This period of performance may be extended by mutual written agreement of the parties. Performance of Tasks: The proposer’s response or approach to performing the required tasks should be described. If more than one person is to be involved in these tasks, it is important that the roles of each individual be clearly specified. Experience: Prior experience with providing the same or similar services should be itemized. Include dates and size of organization assisted. Names, addresses, and phone numbers of references must be included. Capabilities: The successful proposer must demonstrate access to standard office equipment, including computers (for word processing, generating mailing labels, and financial records and analysis), copiers, telephones, and facsimile transmission. The proposer’s means of access to such equipment must be specified, whether owned, rented, or otherwise used on an as-needed basis. Personnel: The proposer should identify all persons who would actually provide services to AKA by name, including their qualifications and amount of time to be devoted to AKA business. If services proposed are to be performed by more than one person, the proposer must identify specific roles and responsibilities of each. The proposer will also document how the work of the Association will be performed if and when the proposer’s key staff is ill, on vacation, or otherwise temporarily unable to perform their duties. Cost: The proposer should specify a total price for the performance of the tasks shown above, and then specify in detail all charges and fees associated with the performance of the required tasks. Services (labor hours) must be provided on a fixed-price basis, with one price for the entire year. Responsiveness to Tasks. The proposer’s understanding of the work required by AKA should be demonstrated by the text and supporting exhibits indicating the proposer’s approach to the required tasks. Capabilities for Performance: Demonstrated experience in periodical publication is important, as is a knowledge of kiteflying, and of associations of kitefliers or similar groups. Proven leadership skills are essential, as are skills in cooperation, collaboration, and compromise. The proposer should possess or should demonstrate access to appropriate equipment, skills, and backup services to discharge the required tasks successfully. Cost: Cost is not the only evaluation factor, and AKA may accept a proposal that is not the least expensive. Nonetheless, the proposer should understand that AKA is a membership-funded organization with distinct limits to its resources. Proposals that achieve the stated objectives in the most cost-effective manner will be highly ranked. Proposals will be screened by the AKA Kiting Editor Selection Committee and the most highly-ranked proposals will be forwarded to the AKA Board of Directors. Proposers are cautioned that final decisions may be made solely on the basis of the written proposal, so that this proposal should fully and accurately present the proposer’s best terms and qualifications. AKA also reserves the right to contact final candidates for this position for telephone or personal interviews. The successful proposer will sign a contract with AKA that will commit the parties to a written contractual relationship. Negligence or nonperformance will be among the grounds for early termination of the contract. The contract will establish provisions for payment for services. The Kiting Editor/Publisher must be an AKA member in good standing.